5.5 oz., 100% combed ringspun cotton jersey creeper three-snap bottom. 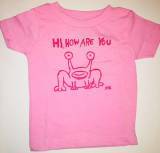 Silk screen pink logo on pink 100% cotton tee. Silk screen blue logo on blue 100% cotton tee. 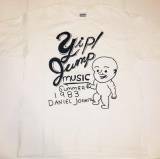 Silk screen print on Gildan 100% cotton tee shirt. LIMITED SIZES and QUANTITIES. WHILE SUPPLIES LAST. Silk screen design on Gildan 100% cotton tee. 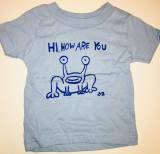 60% Cotton 40% Polyester child's stretch, ribbed tank with Daniel Johnston's Hi How Are You MURAL image. LIMITED - WHILE SUPPLIES LAST! With Hi How Are You MURAL design (as shown) unless otherwise specified (as ALBUM DESIGN).